. 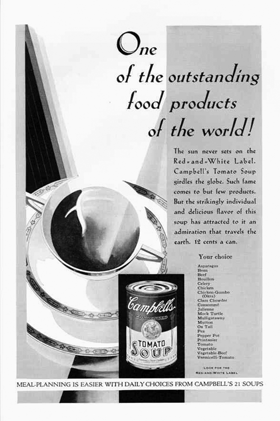 . . Campbell's® began as a fruit preserves company, but the United States Supreme Court in 1893 designated the tomato as a vegetable for trade purposes, rather than the fruit that it actually is. What was the constitutional argument? That's anyone's guess.
. . . In 1898, Herberton Williams, a Campbell's executive, convinced the company to adopt a red and white color scheme because he was taken by the crisp colors of the Cornell University football team's uniforms.
. . . the "Campbell's Kids" were created in 1904 by Grace Gebbie Wiederseim Drayton (1875 - 1936). 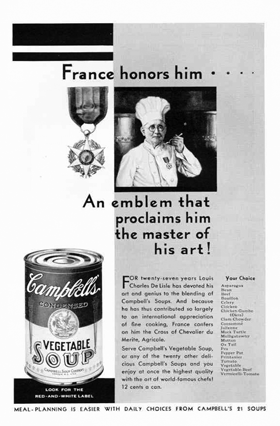 The images are still used in Campbell's Soup advertising with few modifications.
. . . Campbell's soups won the Gold Medallion for excellence at the 1900 Paris World Exposition; the Medallion has been featured on Campbell's soup labels ever since.
. . . The five original kinds of soup the company made were: Tomato, Consommé, Vegetable, Chicken, and Oxtail (yummm . . . ).
. . . twenty-one flavors, including the perennial favorites, tomato and vegetable, were promoted in the company's first magazine ads in the early 1900s. In 1869, two men  a fruit merchant named Joseph Campbell and an icebox manufacturer named Abraham Anderson  shook hands in Camden, New Jersey, to form a business that would one day become one of the most recognized in the world and serve as a symbol of Americana: Campbell Soup Company. Originally called the Joseph A. Campbell Preserve Company, the business produced canned tomatoes, vegetables, jellies, soups, condiments, and minced meats. In 1897, the fortunes of the company changed. Then general manager Arthur Dorrance reluctantly hired his nephew, Dr. John T. Dorrance (18731930), a twenty-four-year-old chemist. Dr. John T. Dorrance, a chemist who had trained in Europe, was so determined to join Campbell that he agreed to pay for laboratory equipment out of his own pocket and accept a token salary of just $7.50 per week. John Dorrance invented a process for making the condensed soup by eliminating water from the cans, thus reducing the costs for packing, shipping, and storage. Dorrance's breakthrough allowed the company to reduce the price of a 10.5-ounce can of soup from thirty cents to a dime. 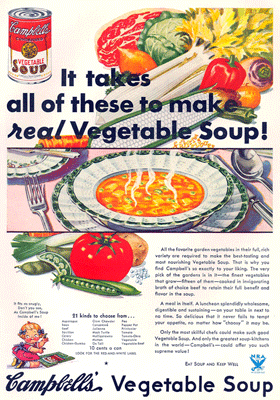 The idea became so popular with Americans that in 1922, the company formally adopted "Soup" as its middle name. Timing played a crucial role in the company's success since it emerged at the advent of mass canning technology. In the 1830's Napoleon offered a reward of 12,000 French Francs to anyone who could provide a safe, long-term method of preserving food for his troops. One of the war strategies at the time was that of destroying crops so there was no food to sustain advancing troops. Napoleon wanted food stock that could be safely stored. A Frenchman named Nicolas François Appert (1750 - 1841) modified existing bottling techniques and won the prize. By the time Campbell and Anderson formed their partnership, mass canning technology had developed fully and canned food was taking off. 1869: Joseph Campbell, a fruit merchant, and Abraham Anderson, a tin ice box manufacturer, form a partnership to can tomatoes, vegetables, jellies, condiments, and minced meats in Camden, New Jersey. Each can is made by hand and the firm is best known for its giant beefsteak tomatoes. Each large enough, it is said, to fill a single can. 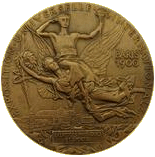 1876: The Joseph A. Campbell Preserve Company is awarded a medal for quality at the Philadelphia Centennial Exposition. The partners disagree about the direction of the company; Campbell promoting rapid expansion and Anderson opting for slow and gradual growth. Though they remain life-long friends, they dissolve the partnership and Joseph Campbell purchases Anderson’s share of the company. Arthur Dorrance (a wealthy timber and flour merchant) and Joseph Campbell form a new company, Joseph Campbell & Company. 1891: The company’s name changes to Joseph Campbell Preserve Company, incorporating in New Jersey ten years hence. "Beefsteak Ketchup" is their best known product, a sauce more like A-1 Suace than what we refer to as ketchup today. At the time, it is considered a kitchen staple. 1893: The United States Supreme Court designates the tomato as a vegetable for trade purposes, though it is botanically a fruit. 1894: Arthur Dorrance succeeds Joseph Campbell as President; Campbell retires and dies six years later in 1900, ending the association of the Campbell family with the company. 1895: The Joseph Campbell Preserve Company markets ready-to-serve beefsteak tomato soup. An advertising committee is formed and a hundred large signs promoting the company are erected in and around the eastern metropolitan areas of Philadelphia, New York, and St. Louis. 1897: Owner Arthur Dorrance reluctantly agrees to hire his 24-year-old nephew, Dr. John T. Dorrance, as a company chemist, using his own laboratory equipment. Dr. Dorrance develops the formula for commercially condensed soups. The five original varieties are Tomato, Consommé, Vegetable, Chicken, and Oxtail. 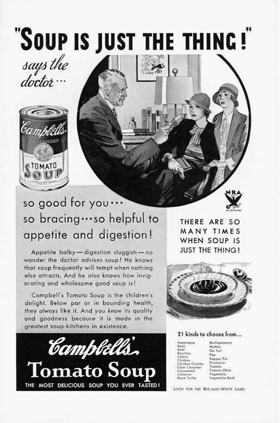 Dr. Dorrance sets out to persuade Campbell's public to eat soup and convinces buyers that his inexpensive, condensed soup is also high quality. To that end, he takes to the road offering samples of the soup line. The soups are an instant success, manufactured at a rate of ten cases per week. 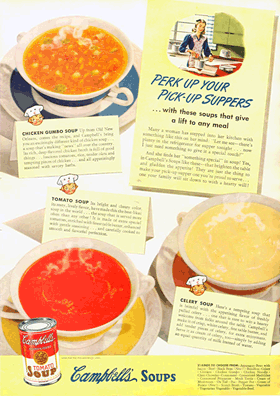 Dorrance convinces housewives to buy canned soup instead of making their own at home, showing them that Campbell’s soups are inexpensive and time-saving. 1898: A company executive attends the annual Cornell-Penn football game and is so taken with Cornell's brilliant new red and white uniforms that he convinces Dorrance and Campbell to use the colors on soup labels. It's the single most successful promotional decision Campbell's ever made. Thanks to the success of the condensed soups in the red-and-white cans, the company is profitable for the first time in its history and Dr. Dorrance receives a "huge" increase in salary--to $9.00 a week! 1899: Mass advertising is still relatively rare in the US, so Dorrance takes a risk in placing the first advertising on New York City streetcars. New York sales increase by100%. 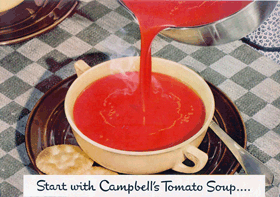 The first ads include a jingle promoting soup and a large illustration of a red-and-white can of Campbell’s soup. 1900: Campbell's soups win the Gold Medallion for excellence at the Paris Exposition; the Medallion has been featured on labels ever since. 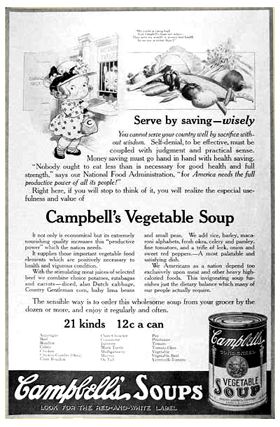 1902: The Campbell's brand is by now nationally recognized and trusted. The company pays the first in an unbroken series of cash dividends. Campbell expands the line to include 21 varieties, a number that would remain constant for the next 30 years. The soups acheived a thoughtful blend of American and European cooking traditions, creating a product line both cosmopolitan and familiar at the same time. 1904: At the time, a huge problem exists throughout the soup industry; the long duration required for soup stock to simmer, leaves the workers unproductive for much of the day. John Dorrance adds a new product to be manufactured during the simmer wait times--Pork and Beans--which becomes a very profitable sideline. The Campbell Kids are "born" when a Philadelphia illustrator named Grace Wiederseim sketches them for a series of streetcar advertisements. They are destined to become hugely popular, eventually reproduced as postcards, lapel buttons, and various other pieces. Originally posed as little boys and girls playing children’s games, the Campbell Kids mature in Campbell's advertising pieces over time, eventually performing more traditional adult tasks such as climbing a fireman’s ladder and delivering ice. 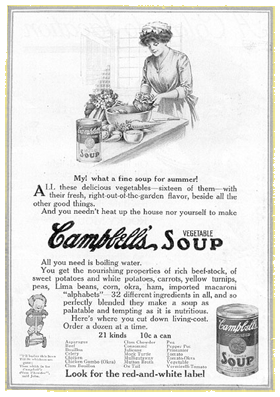 1905: As sales of soup increases, Campbell ceases the manufacturing of preserves, jellies, jams, and fruit butter, and to reflect that shift, Joseph Campbell Company is adopted as the corporate name. 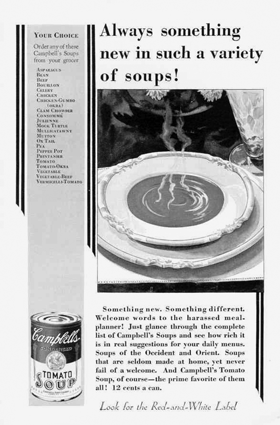 The first magazine advertisement in Good Housekeeping notes: "21 Kinds of Campbell's Soup  16 million cans sold in 1904." 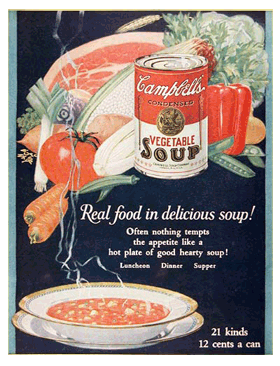 Campbell’s condensed soups are manufactured at a rate of nearly 40,000 every week. 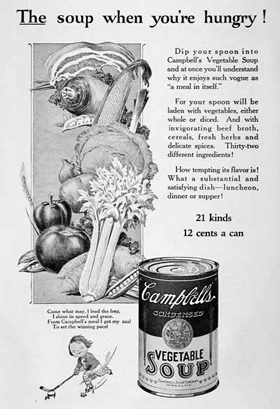 1907: Campbell abandons the production of mincemeat, focusing only on its most profitable product: condensed soups. Marketing genius John Dorrance effects a huge change in American eating habits by publishing a number of cookbooks and meal planners, creating a nation of canned soup eaters. 1910: "Campbell Kids" dolls are offered as promotional items and are another huge hit and instant collectors' items. 1911: Campbell's enters the California market, giving the brand national distribution. 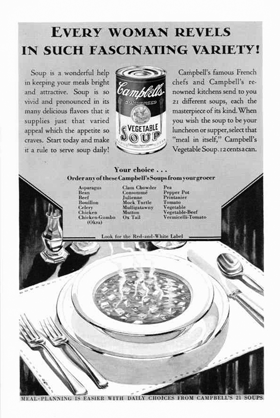 One of the first ever efforts at market research, devised by the Curtis Publishing Company, finds that advertising is extremely successful and that Campbell’s soups are not bound to any one income class: a great majority of the people, regardless of income, eats one or more of the 21 varieties. 1912: Dorrance hires Harry Hall, an agricultural expert, whose responsibility is to advise farmers under contract to Campbell in all aspects of vegetable growing. Tomato farmers are actually provided with seeds, the product of Hall’s efforts to breed the perfect soup-making tomato. 1913: Campbell's Chicken with Rice and Cream of Celery soups are introduced. 1914: Dr. John T. Dorrance assumes the Presidency of the company. 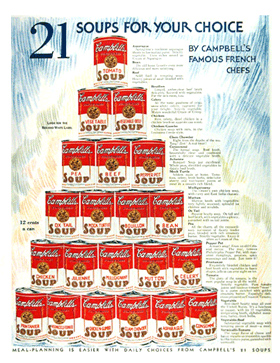 Campbell advertises primarily in magazines, insisting that its ads be "the first advertisement following said text, on a right hand page facing a full page of text." This strategy is so successful that this advertising location is still known as the "Campbell’s soup position." 1915: Campbell acquires the Franco-American Food Company, maker of gourmet foods. The Franco-American brand is continued for spaghetti and other pasta products. John Dorrance buys out his aging uncle, Arthur, and becomes the sole owner of the Joseph Campbell Company. 1916: The idea of cooking with condensed soup is introduced when Campbell publishes its first cookbook, "Helps for the Hostess". 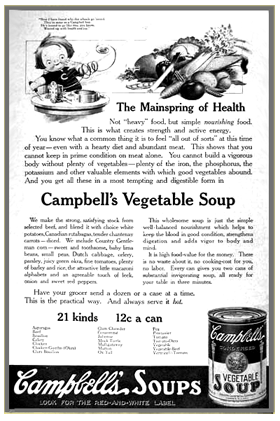 Today, more than one million cans of soup are used every day in recipes in the U.S.
1921: The Joseph Campbell Company is formally dissolved and sold for one dollar to a newly formed company: Campbell Soup Company, reflecting its most famous and profitable product. 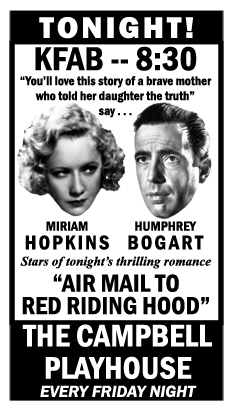 1926: Full color advertisements debut in leading women’s magazines. 1930: Dr. John T. Dorrance dies and is succeeded as President by his brother, Arthur C. Dorrance. A Canadian subsidiary, Campbell Soup Company Ltd., is organized, beginning production at it's first plant in Toronto the following year. 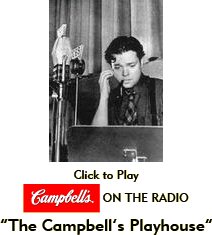 1931: Campbell begins radio advertising. 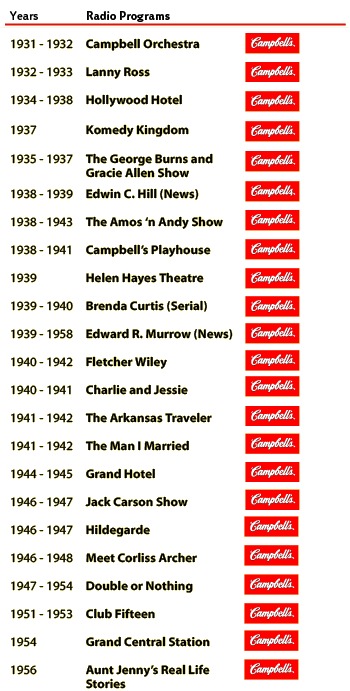 In the years to follow, Campbell sponsors famous radio programs like the George Burns and Gracie Allen Show and the Campbell Playhouse. The familiar "M'm! M'm! Good!" slogan dances on the airwaves during these broadcasts. 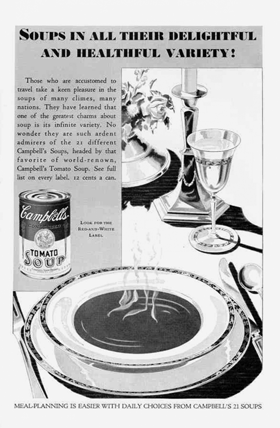 1933: A British Company, Campbell's Soups Limited, is organized. 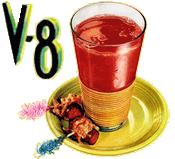 V8 Vegetable Juice is invented by Evanston, Illinois's W.G. Peacock and his son. W.G. Peacock was the founder of the New England Products Company, which manufactured individual vegetable juices under the brand name Vege-min. Having had only mediocre success in selling them, in 1933 Peacock began blending the Vege-min juices into one and selling this new concoction as "Vege-min 8." A grocer in Evanston, Illinois recommended that he shorten the name to simply "V-8." 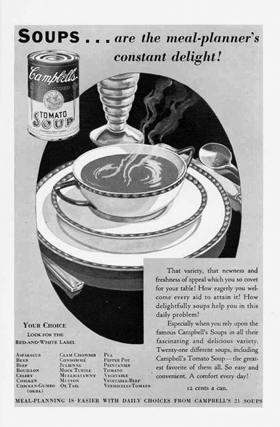 1934: Cream of Mushroom soup is introduced, Campbell’s first soup to be widely used as a sauce. 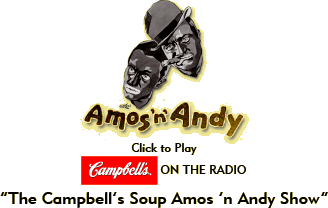 A slip of the tongue on "Amos ‘n’ Andy" actually affects the sales of what is now one of Campbell’s most popular soups. Introduced this year and originally called "Chicken with Noodles," the soup enjoys only moderate success until the night Amos misreads his copy and accidentally calls the product Chicken Noodle soup. Within days, the company begins receiving large orders for this new soup. For some reason, this shift in nomenclature matters and shortly thereafter, the soup is formally renamed "Chicken Noodle." Today, Campbell uses almost a million miles of noodles in its Chicken Noodle soup each year, enough to circle the equator more than 40 times. 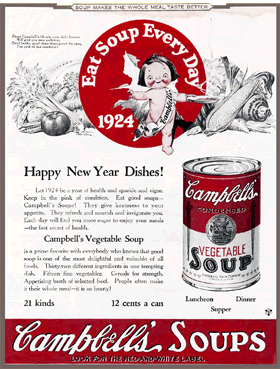 1936: Campbell begins manufacturing its own cans. 1937: Unable to find a wholesome loaf of commercial bread for her asthmatic son, Margaret Rudkin, a Fairfield, Connecticut, wife and mother, founds Pepperidge Farm, Incorporated. Campbell introduces Vegetarian Vegetable soup. 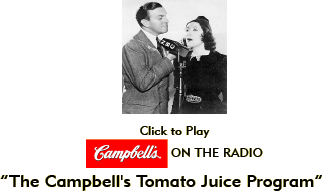 1938: Campbell's Tomato juice is introduced nationally. 1939: Campbell's first formal corporate Agricultural Research Department is established. 1940: The Campbell Test Kitchens open. Campbell home economists develop recipes using condensed soups that become classics. 1941: Campbell publishes its first full-length cookbook: Easy Ways to Good Meals. 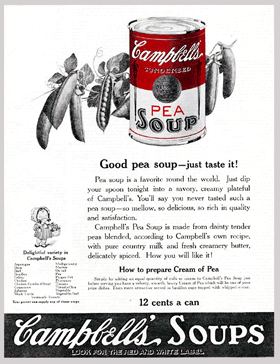 1946: Arthur Dorrance dies, succeeded as President by James McGowan, Jr.
1947: Campbell opens its third soup plant, in Sacramento, California. 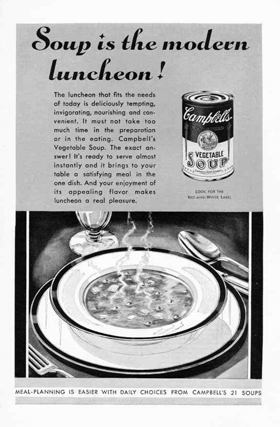 Campbell's Cream of Chicken soup is introduced. Campbell reintroduces Macaroni and Cheese under the Franco-American brand and creates Beef Gravy. 1948: V8 Vegetable juice is acquired. Campbell begins to advertise it, using movie actor Ronald Reagan as a spokesman, among others. 1950: The first Campbell television commercials air. The company goes on to sponsor such highly rated shows as Lassie and Peter Pan. 1953: The Campbell Soup Fund is organized as a private grant-making, non-profit corporation to direct funds to non-profit organizations in the U.S.
1954: Campbell is admitted for trading on the New York Stock Exchange. 1955: Campbell makes a major entry into frozen foods with the acquisition of C.A. Swanson & Sons, originators of the TV Dinner. (Swanson was part of the spinoff in 1998.) Campbell home economists develop the recipe for the Green Bean Casserole, which continues today as one of the company's most popular and most requested recipes. The Pepperidge Farm product line expands to include cookies. 1957: A new corporate headquarters opens in Camden, New Jersey. The company establishes the International Division. 1959: Campbell launches into the Mexican market, forming Campbell's de Mexico, S.A. de C.V. A new plant opens at King's Lynn, England. 1960: Campbell acquires the bakery product manufacturer, Pepperidge Farm, and founder Margaret Rudkin remains president. Campbell also acquires Biscuits Delacre, the Belgian cookie and confection maker. (Campbell later divested Delacre in 1998). 1962: Pop artist Andy Warhol paints his famous Campbell's Soup cans. Once, when asked why, he replies, "Because I used to drink (soup). I used to have the same lunch every day for 20 years." John (Jack) Dorrance, Jr., the son of Dr. Dorrance, is named Chairman of the Board. 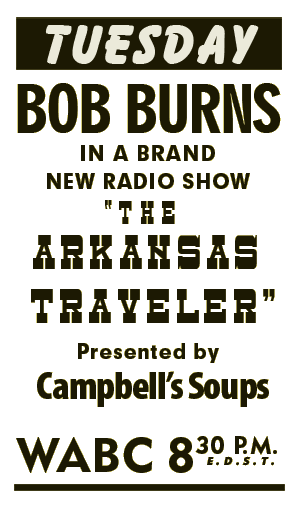 The Burns and Allen Shows aired on radio for 18 years beginning in 1933. 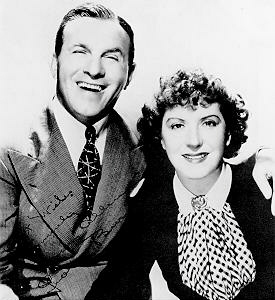 In a showbiz marriage that lasted 38 years, George Burns and Gracie Allen played vaudeville, radio, TV, and the movies. They first teamed up on the vaudeville circuit in 1923 with Gracie signed to play the straight "man" to comedian Burns. But her presence and distinctive voice captured the majority of the laughs which prompted a quick switch of the roles. In 1950 Burns and Allen left radio and moved to television with The George Burns and Gracie Allen Show. 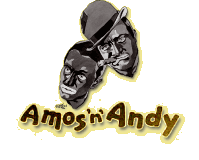 Any critique of the Amos 'n Andy series of radio shows must be tempered with a view of the times. Beginning with their Sam 'n Henry Show collaboration during the earliest days of radio broadcasting, Freeman Gosden and Charles Correll tapped into a deep vein of simple, common experiences that the vast majority of the American public still collectively winced from at the end of The Great Depression. Just getting by, was an all too common economic fact for much of America as early radio broadcasts began to air. Though their characterizations--and mischaracterizations--of Black America were, in every measurable way, socially insulting, the simple wisdom of the protagonists was widely appreciated throughout both rural America and cosmopolitan America alike. As 1940 approached, Orson Welles was a household name. 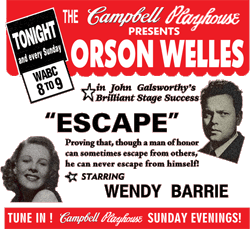 In 1938, despite the controversy still surrounding Welles' "The War of the Worlds" Broadcast, Campbell Soup agreed to sponsor the show, at which time it was renamed The Campbell Playhouse. Orson Welles and the ensemble Mercury Players moved to the West Coast and continued under Campbell's sponsorship for another year. 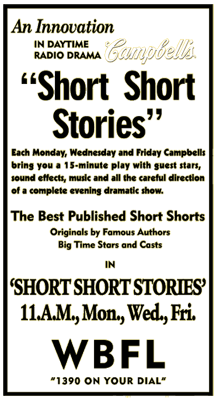 Throughout its sponsorship, Campbell and it's Campbell Playhouse contrinued to reap critical acclaim and remains Campbell's finest contribution to The Golden Age Of Radio.